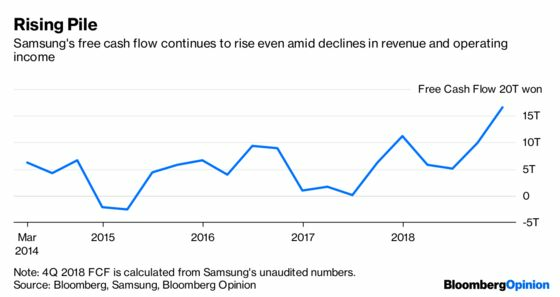 (Bloomberg Opinion) -- Samsung Electronics Co.’s fourth-quarter earnings tell a tale of falling demand for technology products and components. Revenue dropped 10 percent – the most in almost four years – with operating profit down 29 percent, the worst decline since 2016. System LSI is the unit that makes processors and image sensors, while its foundry business manufactures chips for external clients. Samsung joins the growing list of global technology companies reporting trouble in the hardware sector – Taiwan Semiconductor Manufacturing Co., Apple Inc. and Nvidia Corp. among them. But if investors look away from the profit-and-loss account and take a wander through the company’s two other financial reports – the balance sheet and the cash flow statement – they may be pleasantly surprised. Samsung’s cash holdings continue to rise and cash flow from operations looks solid. Add to this Samsung’s announcement in October that it will be more careful with capex, and you start to see an alternative narrative playing out. Free cash flow, for example, climbed 47 percent from a year earlier to hit a record in the December quarter despite that huge dip in operating income. FCF is a measure of how much cash a business is throwing off, and is calculated as cash flow from operations less capital expenditure. For the full year, that figure jumped 93 percent. While growth in operating cash flow was relatively muted (up 3 percent for the quarter, and 8 percent for the year), Samsung’s fiscal discipline has lowered its spending drastically. With revenue set to decline this year, it’s likely that operating cash flow will also take a hit. Yet if Samsung maintains that conservative approach to spending, it could well preserve its ability to generate cash amid the downturn.